Southern’s Joey Weaver putts on the third green at Meigs County Golf Course on Aug. 7 in Pomeroy, Ohio. 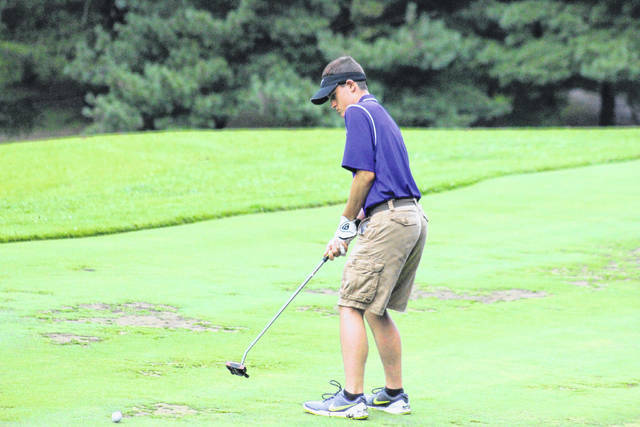 Both Southern and Eastern had their golf seasons come to a conclusion Monday during the boys Division III district tournament held at the Portsmouth Elks Country Club in Scioto County. Neither the Tornadoes nor the Eagles managed to advance to the state meet next week after earning respective team finishes of sixth and eighth, and no individuals from either squad managed to advance as well. North Adams won the team title with a score of 328 while earning the lone team berth for state, while medalist Elijah McCarty of West Union was the lone individual qualifier after firing an even par round of 72 over 18 holes. Southern — which won the TVC Hocking regular season and tournament titles this fall — finished the day with a collective score of 353, while Eastern was nine shots off of their Meigs County brethren with a final tally of 362. West Union was four shots off the pace and finished second with a 332, while Crooksville (339), Coal Grove (341) and Waterford (352) rounded out the top five spots. Pike Western (357) finished in between SHS and EHS, while Whiteoak (404) and Lynchburg-Clay (413) completed the final two spots in the 10-team field. Jonah Hoback — who tied for 13th overall individually — led all the locals and Southern with an 11-over par effort of 83. Jensen Anderson was next with an 85, while Jarrett Hupp chipped in a 90. Ryan Acree completed the SHS tally with a 95, with Joey Weaver also adding a 106 for the Tornadoes. Ryan Harbour led Eastern with an 87, followed by John Harris with a 90 and Kaleb Honaker with a 91. Jasiah Brewer concluded the EHS score with a 94, while Nick Durst added a 105 for the Eagles. Broc Jordan of Western was the overall runner-up with a 74, followed by Trevor Deere (76) of Coal Grove and Wes Jenkins (77) of Waterford. Both Elias Montgomery of Western and Owen Carney of Crooksville rounded out the top five with identical rounds of 78. Visit baumspage.com for complete results of the 2017 Division III District golf tournament held Monday at the Portsmouth Elks Country Club.